Members of the Svoboda all-Ukrainian Union, who are part of the government, and who head regional and district administrations have decided to resign, Deputy Prime Minister Oleksandr Sych has said. "The Svoboda all-Ukrainian Union announces the resignation of members of the Cabinet, heads of regional and district administrations in connection with the announcement of the results of the early parliamentary elections and the formation of a new coalition," he said at a press conference in Kyiv on Wednesday. At the same time, Sych added that according to the law, members of the Cabinet belonging to the Svoboda Party will continue to perform their duties related to the formation of a new government. The current government includes such members of the Svoboda Party - Deputy Prime Minister Oleksandr Sych, Agrarian Policy and Food Minister Ihor Shvaika and Environment and Natural Resources Minister Andriy Mokhnyk. As reported, the early parliamentary elections in Ukraine on October 26 were conducted based on a mixed-member proportional representation. According to the election law, 225 MPs are elected on party lists and 225 in single-member constituencies. 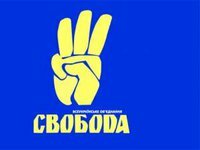 Svoboda failed to overcome the 5% threshold in the October 26 parliamentary elections, whereas six of its representatives were elected to the parliament in single-seat constituencies. Under the Constitution, the cabinet is disbanded when the new parliament is elected.